If you look at most Dungeon or official WotC adventures you will see patterns. Similar and even slightly different patterns, despite innovative authors, appear in organized play adventures. We can work really hard at creating great adventures and yet still not escape the patterns of conventional adventure design. The patterns confine us to predictable interaction between PCs and DM. They also restrict story opportunities. These patterns can be ok, even good in some situations. But the patterns can be broken and should be broken. This is especially true when you want to make a setting feel different, as with Dark Sun. One of 4E’s strengths is that the DM’s job is far easier. You don’t have to spend hours crafting a monster to make it have a few wizard powers. You don’t have confusing equivalency calculations to figure out XP, EL, CR, and appropriate challenge level. You can practically drag and drop monsters and features into an encounter. That time savings can be used on a lot of things, and one of the most rewarding is to think about how to break traditional encounter design patterns for better story, better play, and more fun. Let’s cover a few basic techniques and delve into them in greater detail over time. The easiest way to break the patterns is to have your first step in encounter design be completely unrelated to mechanics. Start by first thinking about the story behind your gaming session. (Session, not encounter… a session can have none to many encounters). After drafting or thinking through the story and how you want events to flow, look to what mechanics (if any, fit the scenes in the session best). Make sure that whatever you use accomplishes your campaign and story goals. Do your best to have a really open mind. Draw on other RPG systems if that helps. During play, adjust as needed to keep your goals in reach while having as much fun as possible. You might have a loose scene, but then realize the players want to role dice. Make it a more formal skill challenge, melding your loose skill scene with actual success and failure. Or, maybe the combat has a skill challenge in it but you are short on time. Drop the skill challenge (maybe keeping one skill to use for one effect) and remove a monster or two. Adjusting on the fly takes practice, but is a great way to get better at DMing. Don’t be afraid to fail! In the Ashes of Athas campaign the admins all are interested in providing new play experiences. Breaking patterns is one of our main goals with the campaign, perhaps second to an emphasis on story. I can’t talk about AoA without spoilers, so instead I will share examples from my own home campaign. 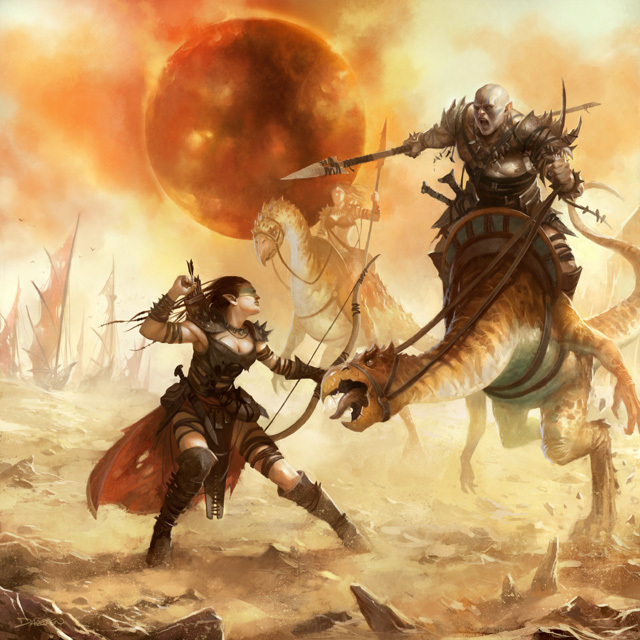 Here are my last two Dark Sun home campaign sessions at the very high level. Session 9: The PCs are traveling south from the lower end of Dragon’s Bowl to the Crescent Forest, seeking a hidden temple. I have placed the temple near Losthome (see Ivory Triangle, it is settled by halflings that escaped Gulg). What I don’t do is to start pulling out monsters and dungeon tiles. What I instead do is think through my story goals. In the next blog entry I will share the thought process I used for session 8’s design and where I ended up. This entry was posted on October 9, 2015 by Alphastream and tagged 4E, Ashes of Athas, Authoring, Crown of Sorrow.